Looking back beyond hot tub cinema I think the seed of my obsession may actually have been planted last summer when, two days before I was due to attend the Secret Garden Party festival in Cambridge, a friend who’d had to drop out offered me her ticket for ‘Bathing in the Sky.’ For the princely sum of twenty-something pounds I had procured a ticket to what I couldn’t have known then would prove to be a lifeline on the third day of a particularly muddy festival. Inside this veritable Garden of Eden were not only the most delightful wooden hot tubs, set amongst a leafy green Hobbit-esque enclave away from the grubby horrors of the camp site and stages, but also shower facilities that would leave even the filthiest of revellers gloriously clean. In short, the two hours I spent there with my boyfriend and my best friend were amongst the best of my life, and I emerged feeling like a new woman. Given my soon-to-be-part-time employment status I’ve no idea why I started browsing the internet and torturing myself with all of the amazing hot tub options on the market (although I couldn’t help but notice Arctic Spas do an ‘extreme bargain’ option on reconditioned, used hot tubs – surely I could save up for one of those?! ), but what I am increasingly beginning to feel is that, until I have a hot tub to call my own, I simply will not have ‘arrived’ in life. Picture this: After a hard day’s work you come home, walk through the door, hang your coat up and go upstairs to change into your fluffy white bath robe and slippers. Moments later you walk through the kitchen, pour yourself a glass of chilled Prosecco and open up the doors to the patio, upon which sits a glorious hot tub. Steam swirls invitingly up from its surface as you remove your robe and sink beneath the water. Within moments your troubles are all but forgotten and you are transported somewhere else entirely; your muscles relax, you close your eyes and you are home. Doesn’t everyone dream of this? 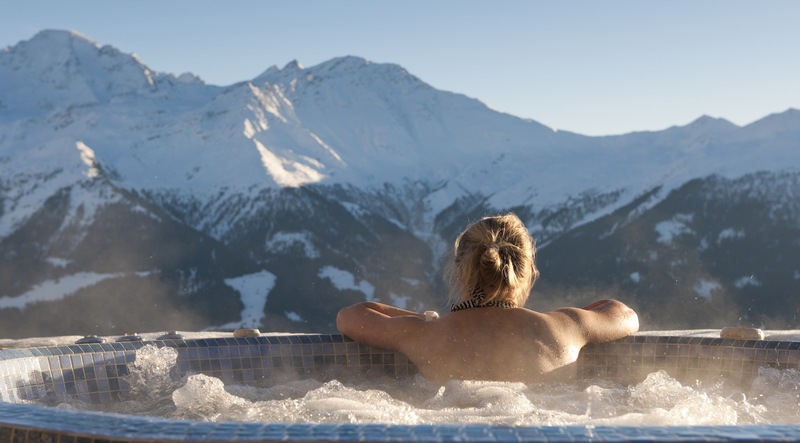 Okay, maybe not everyone, but few could deny a hot tub is a welcome addition to any ski holiday. Thus far in my skiing career (and I use the word ‘career’ loosely) I can’t say I’ve been able to afford a chalet with its own private hot tub, but just as in my previous example I imagine it would be a thing of great beauty and a most enjoyable experience to dip a post-ski frozen toe into the warmth of the water within. It’s the decadence, really, that I covet. Nobody needs a hot tub to survive, granted, but what a lovely treat to come home to. There must surely be some research somewhere on the positive benefits of owning one; I’d hazard a guess they reduce stress in much the same way as owning a cat (though don’t quote me on that). This entry was posted in Uncategorized and tagged Arctic Spas, Bathing in the Sky, bubbles, dream, hot tub, hot tub cinema, luxury, relaxation, saving, Secret Garden Party, skiing, steam, stress by Belle365. Bookmark the permalink. Reblogged this on Visiting Massage London.